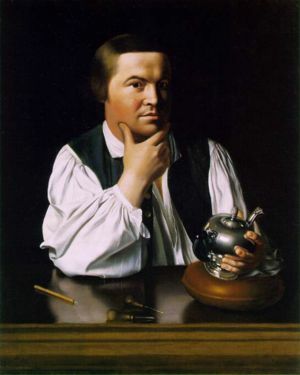 Paul Revere (1734-1818) American patriot, silversmith, and engraver in colonial America, best known for his ride in the Massachusetts countryside on the night of April 18, 1775. During the ride, he rang bells both to alert residents of the coming British troops and to warn the British that the colonies would be armed and free, and neither would be taken away. His actions allowed the colonists to assemble for the first colonist victory in the American Revolution. Revere was born in Boston, Massachusetts, on December 21, 1734, the son of Apollos De Rivoire, a French Huegunot refugee who came to the colonies as a child (and had Anglicized his name to Paul Revere), and Deborah Hitchborn, a daughter of a shipping owner. His schooling was meager, but he managed to learn to read, write, and do arithmetic before he left school for good at the age of thirteen. In his father's shop he learned the art and trade of the silversmith, fashioning gold and silver objects for sale to the wealthy, and young Revere would grow into one of the leading artists in silver, as well as being one of the very few who would finish a project rather than pass it on to another engraver. He had also branched into other aspects of the metal industry, fashioning parts for spectacles and false teeth, and copper engraving for illustrations in books and newspapers; his best-known work in that later field was The Boston Massacre, illustrating that event in 1770. He was a committed patriot, a member of the Sons of Liberty in Boston; he was among the group of fifty who donned Indian dress and raided several British merchant ships in an act of protest of taxation without representation in the Boston Tea Party of 1773. On April 16, 1775, aware of pending troop movements, he rode to Concord, Massachusetts to warn residents there and urge them to move their stockpile of arms. Two nights later in April 18, he observed a pre-arranged signal of lanterns hung in the bell tower of the Old North Church and knew that British regulars had been ferried across the Charles River to Cambridge; they were on the move towards Concord and Lexington to seize the armory stores and arrest leading patriot leaders, among them John Hancock and Samuel Adams. After being rowed across the river himself, Revere borrowed a horse and set out on his famous "midnight ride" to sound the alarm; he succeed in warning Hancock and Adams, as well as verifying that the local Sons of Liberty in Lexington had seen the lantern signal from Boston. He was joined by a second rider, William Dawes, and together they rode towards Concord to warn the residents there; a third rider (Dr. Samuel Prescott) would join them as well. But a British patrol in the area stopped and arrested them; Prescott escaped almost immediately, and would succeed in carrying the alarm to Concord. Dawes would escape within hours, while Revere was released later, to make his way on foot to witness the "shot heard round the world" on Lexington Green, the opening battle of the American Revolution. Apart from the construction and operation of a badly-needed powder mill, his own service in the revolution would be undistinguished. He was commissioned a lieutenant colonel in the Massachusetts militia, charged with the defense of Castle William; he had also participated in the failed Penobscot expedition in June, 1779. A court-marshal would effectively end his service, despite the charges being dismissed. After the war few bought his silver work, but his knowledge of metal and industry allowed him to branch out with relative ease. He created a factory which rolled out sheet copper, supplying the metal which covered the dome of the Massachusetts State House, and the sheeting which covered the hull of USS Constitution, one of the first frigates of the new navy. He had also cast church bells in response to the Second Great Awakening, a religious revival in the early-19th century. Paul Revere died at his home in Boston on May 10, 1818, and is buried at the Granary Burying Ground. His midnight ride was immortalized by a poem by Henry Wadsworth Longfellow. This page has been accessed 36,147 times.